Prior to the snowstorm of 2010 arriving in Charlotte Sunday night, I went shopping for a sled over the weekend. My mother told me to go to Bed, Bath and Beyond. I thought this was strange but arrived at the store to find that they had sleds, dog safe salt for your driveway and a device to make snowballs. The modern day superstore. Standing in line to pay, I saw a portable breathalyzer machine the size of a remote control on your car keys. Hanging next to the alarm clocks, ice packs and drain cleaners was a portable alcohol testing device. I blogged about one being sold at Office Depot during the Christmas holiday season. I was shocked then, but Bed, Bath and Beyond? Really? As I stated in an earlier post, these machines are scientific instruments that are still capable of error when properly calibrated and operated by trained police officers. 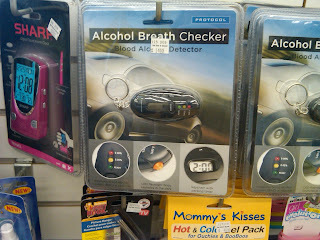 I'm curious to know how people feel about this being sold at a store that specializes in household items.